Chelsea ran out comfortable 4-0 winners against PAOK in Group L of the Europa League as the Greek side were forced to play with ten men for 83 minutes. The game started catastrophically for PAOK as they were reduced to ten men after just seven minutes. With Olivier Giroud bearing down on goal, PAOK's Yevhen Khacheridi cynically brought the Frenchman down and was given his marching orders. 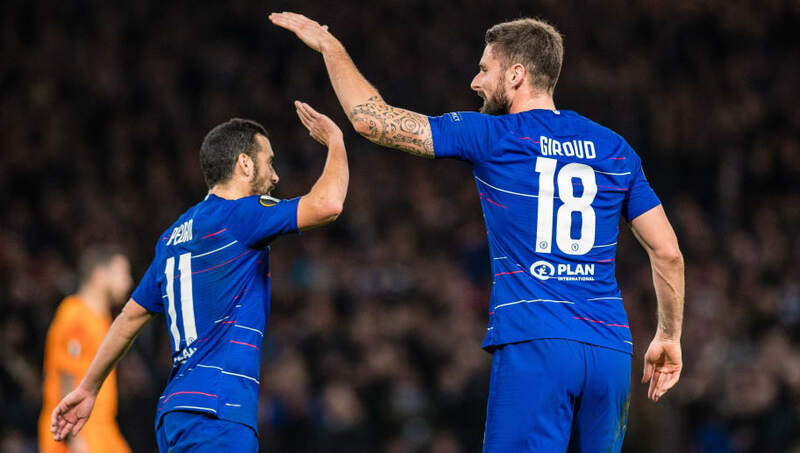 After a sustained period of pressure, Chelsea eventually broke through in the 27th minute as Pedro's lay-off was beautifully curled into the bottom corner by Giroud. The Blues nearly doubled their lead just seconds later as Callum Hudson-Odoi's effort cannoned off the crossbar. Chelsea doubled their lead in exquisite fashion in the 36th minute. Cesc Fabregas, with time to pick his head up, sent a pinpoint pass over PAOK's defence and onto Giroud's foot as the Frenchman volleyed an unstoppable finish beyond Alexandros Paschalakis. In the 59th minute, Chelsea put the game beyond doubt as they went 3-0 up and it was a monumental moment for Hudson-Odoi. The 18-year-old cut in from the left and punched a low finish into the bottom corner to score his first senior goal for the club. The Blues weren't done there as they made it 4-0 in the 77th minute as Alvaro Morata nodded in Hudson Odoi's cross in what was his first touch of the ball having been subbed on for Giroud only moments earlier. Following their 3-1 demolition at the hands of Tottenham Hotspur on Saturday, all eyes were on how Chelsea would react on Thursday night. Whilst Kepa was the only player to retain his spot against PAOK, the Blues put their woes behind them with ease. Chelsea FC To Win UEL 2018/2019. Sarri's side regained their calmness in possession and were rarely troubled defensively as they dominated the ball. Whilst there will certainly be tougher tests to face, a confidence boosting win was exactly what the doctor ordered for Chelsea and they will go into their game against Fulham with confidence. STAR MAN: Such was the easy nature of the game for Chelsea, there were plenty of candidates for the 'star man'. However, it was Giroud who stood out amongst the rest as the Frenchman netted twice. The Blues' striker was also the player brought down for PAOK's early red card. Take a closer look at both of Giroud's goals, he took both of them one time without thinking twice. He has that striker's instinct and he'll always go for the shot before anything else. That's what I want from my striker. With Alvaro Morata struggling for consistency, this was Giroud's chance to stake a claim for a starting spot in Sarri's side. The two-goal salvo will certainly have improved his chances and he will count himself unlucky if he doesn't start against Fulham on Sunday. WORST PLAYER: With such a convincing scoreline, it can often be difficult to name a 'worst player'. However, Davide Zappacosta was that man for Chelsea today. The Italian full-back was erratic in possession and tentative in his defending throughout. Where he ought to have crossed Zappacosta opted to shoot and when he did cross the ball often failed to beat the first man. The Italian will have to improve drastically if he is displace Cesar Azpilicueta from the starting 11. With Chelsea coming into this game off the back of a woeful defensive performance, PAOK simply had to try and test the Blues defensively on Thursday night. This would have represented their best opportunity of getting a result at Stamford Bridge. However, the Greek side offered virtually nothing in the attacking third and allowed Chelsea's defence to have a comfortable evening. The loss now leaves PAOK staring elimination in the face as they sit bottom of Group L on three points. Substitutes: Rey, Varela (6), Pelekas (6), Pelekas, Bisewar, Akpom, Warda (6*), Canas. STAR MAN: PAOK were never likely to land a punch on Chelsea following their seventh minute red card and this proved to be the case as the Blues cruised to victory. However, second half sub Amr Warda was a positive in what was an otherwise gloomy evening for PAOK. Warda was subbed on at the start of the second half and played with direct urgency. Whilst his efforts did not result in a goal for PAOK, Warda certainly provided a greater attacking impetus for the Greek side and can be proud of his performance. WORST PLAYER: It's rare that a player who only played seven minutes in a match is labelled the 'worst player', but that's exactly what Yevhen Khacheridi has achieved. Having allowed the ball to run through to the grateful Giroud, Khacheridi tried to make amends with a last ditch challenge but was subsequently sent off. From this point on, it was always just a matter of damage limitation for PAOK. It's never easy to go to Stamford Bridge and get a result against Chelsea and Khacheridi single-handedly turned an uphill challenge into an insurmountable one. Day to forget for the Ukrainian international. Next up for Chelsea in the Europa League is Vidi away from home. However, with 15 points on the board and top spot guaranteed it will provide Sarri with another opportunity to rest key players. PAOK, meanwhile, will play BATE at home in what is a must-win game for the Greek side if they are to progress to the next round of the Europa League.